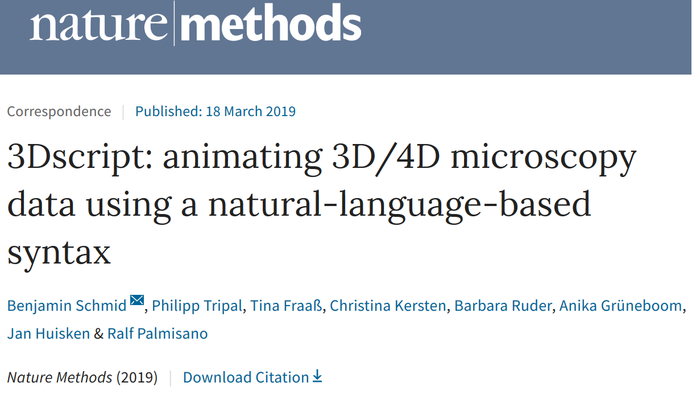 The OICE team is very happy to share a new tool which will enable researchers to easily animate their 3D/4D imaging data, without the need to learn a programming language or to buy expensive software solutions. Just download our new tool 3Dscript at Github, load it into Fiji/ImageJ use the online documetation and go! 3Dscript, an ImageJ/Fiji plugin2, addresses the need for an intuitive way to assemble complex and high-quality animations. Here, animations are described by a list of instructions such as “From frame 0 to frame 180 rotate by 180 degrees horizontally ease-out”, written in a syntax that is based on natural English language. Thank you to all co-authors! Here it is the first fully FCS integrated turn-key system and in addition also multi-functional as it also allows FLIM and Multi-Photon imaging. Now with the amazing effort of OICE staff who never asked about the time of day or day of week, we haved moved into our new home. IZNF Research Building, Cauerstr. 3, 91058 Erlangen. All this with only four weeks of downtime. This means OICE will be open to public and for imaging on Monday 11th. Not only will there be three allocated working spaces in our new S2 GenTG laboratory, we are also very pleased to announce the arrival of a new instrument. A Zeiss Celldiscoverer 7 for automated live cell imaging of slides as well as plates. Furthermore we extend our service by offering two high-end post image processing workstations for users of OICE, which will be available in due course, too. So stay tuned, as we will announce workshops and seminars soon. Hello, a new year always delivers a number of challenges and opportunities. 2019 starts with a challenge, that will in the end create opportunities. We have now started the process of transferring the institute to its new research building. We are still positive and looking forward to re-open in week 6, somewhere in between 4th and 8th of February. on Friday afternoon 30th of November I have been informed, that the state building authority (Staatliches Bauamt) has postponed the start of work in the new building into the next year. This was not foreseeable and is beyond our responsibility. OICE will REMAIN open until 6 p.m. Wednesday 9th of January 2019. We have now rescheduled everything and plan to do the move between January 11th and 1st of February. Currently the GenTech audit is scheduled for the 28th / 29th of January 2019. OICE is aiming to be back to full service on Monday 4th of Februar. Here you can download a detailed schedule. Six years after the successful application for a new research infrastructure building (together with the Excellence Cluster "Engineering of Advanced Materials") the time to say good-bye to our old place is nigh! OICE will stop public business on Wednesday 9th of Januaryr, late. We will then be fully enganged into preparations for the moving of labs, offices and microscopes to happen in the second/third week of January 2019. If everything goes well, apart from the unavoidable little incidents that for sure will happen, we are looking forward to re-start work on the 21st and awaiting official inspection and approval for work under GenTech regulations on Tuesday 29th of January. This would mean that OICE will be back for full service and operational on Wednesday the 30th of January 2019. We are quite happy to announce that the new 2 channel Leica TIRF microscope (fully motorised stage, motorised condensor changer and objective turret and 488 nm and 561 nm excitation laser lines and Leicas latest HC PL APO 100x / 1.47 oil objective) has arrived and will be available within he booking system from October 1st. OICE members of staff and first users recieveing their introduction by Leica application specialist and obviously look already excited! OICE will deliver a practical workshop by end of October please stay tuned for the announcement. We are sorry to have been informed that Prof. Maxime Dahan, who just had visited OICE for a Mini-Symposium passed away today. Our thoughts are with his family. Maxime is fourth from left on his visit last week. OICE is very happy to announce a one-day symposium with a remarkable line-up of invited speakers on Thursday 26th of July, starting at 9 am (s.t.). Prof. Elisa May, University of Konstanz, Germany - "Optical control and analysis of DNA damage repair with ultrashort laser pulses"
Prof. Jason Swedlow, University of Dundee, UK - "OME’s Bio-Formats, OMERO, & IDR: Open Tools for Accessing, Integrating, Mining and Publishing Image Data @ Scale"
After lunch there will be talks by members of staff from OICE about latest available technologies and methods for OICE user. The symposium is free of charge, but registration with Monika Lang (monika.g.lang@fau.de) is mandatory. The full schedule can be downloaded here. 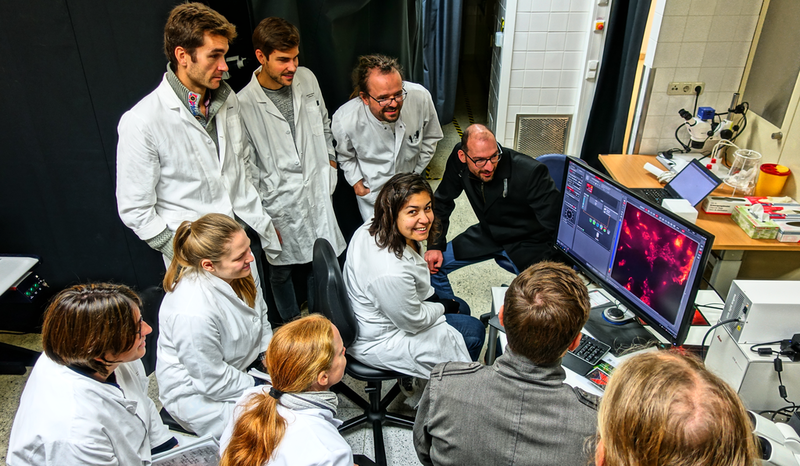 The workshop provides a forum for researchers and confocal microscopists in talks, hands-on sessions and discussions to test approaches and instrumentation for advanced imaging applications. We have taken the recent announcement of the ZEISS LSM 8 Family with its revolutionary Airyscan detector module together with the introduction of our first automated inverted microscope, that shall enable participants to quickly get an overview of current applications and the most recent instrumentation. For more informatiuon and registration please follow this link latest by June 7, 2018 or open the pdf flyer directly here. 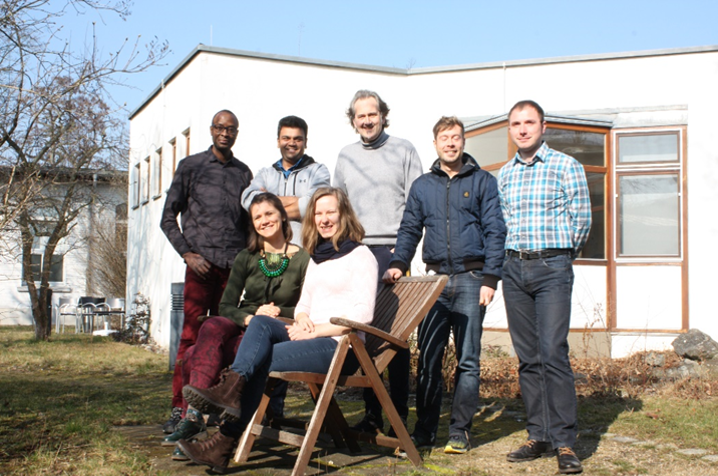 We are looking forward to welcoming you in Erlangen and at OICE! 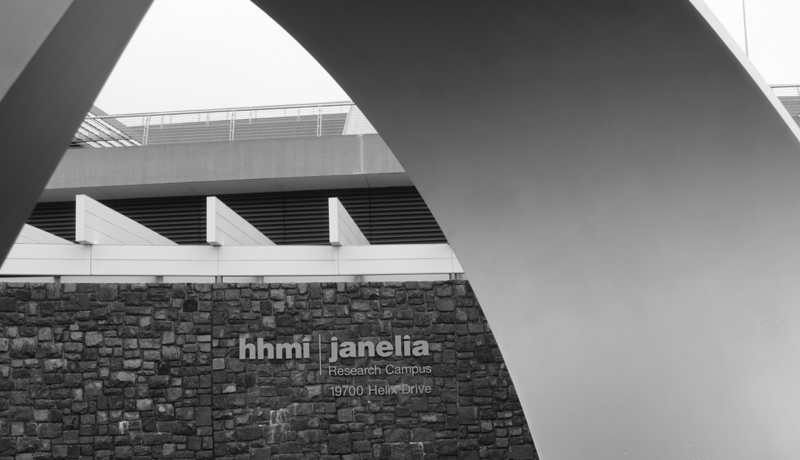 It is with great pleasure that OICE has been acknowledged by the international microscopy community and had been invited to participate in the Symposium: Frontiers in Microscopy Technologies and Strategies for Bioimaging Centers Network at Howard Hughes Medical Institute, Janelia, USA. Some 60 handpicked attendees from across the globe were asked and invited to join this symposium. 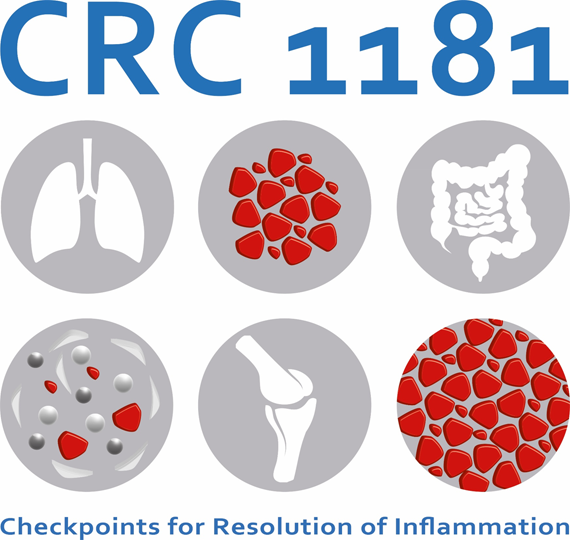 Its aim is to connect on scientific levels and to set-up a network of excellent imaging and research institutes on a global scale. In 2017 DFG openend a call asking for proposals to set-up a special techonolgy driven funding initiative. 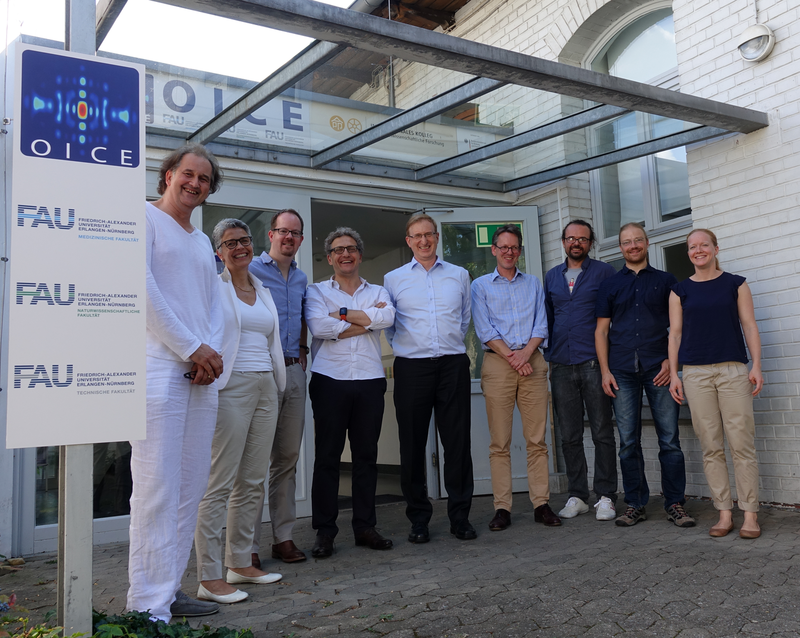 OICE was part of a group of 8 scientitific groups from Germany. We applied for setting up a special call for new and innovative light microsscopy techniques. The proposal of our consortium was successsful over 7 other proposal. This finally leading for this call by the DFG in January 2018: Großgeräteinitiative: Neuartige, experimentelle Lichtmikroskope für die Forschung. Furthermore the President of FAU supports the application of researchers from the natural and medical sciences, co-ordinated by OICE. 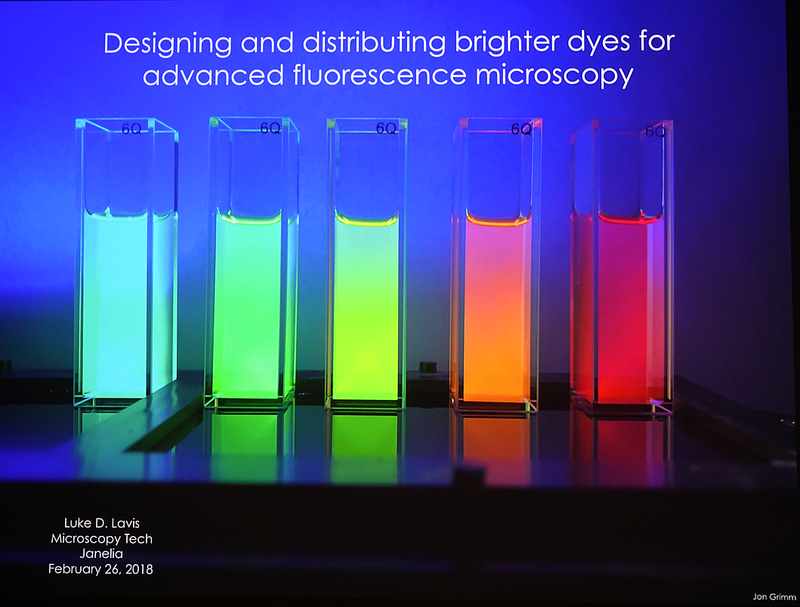 Thus we are looking forward to hopefully succeed with our application for newly established state-of-the-art light microscopy, not yet available to the market and thus spear-head research in this field of imaging. type IV secretion mechanism for CagA delivery. OICE is quite happy to have been able to contribute to this work, which led to a publication in Cell Host & Microbe. Furthermore the Friedrich-Alexander University thought this to be worth an official press release, too. You find the full text article online at Cell Press. Z-drift compensation unit for STED and RESOLFT with our Abberior super-resolution system. Upgrade to Definite Focus 2 from the wacky first release on our Zeiss Spinning Disc Microscope. 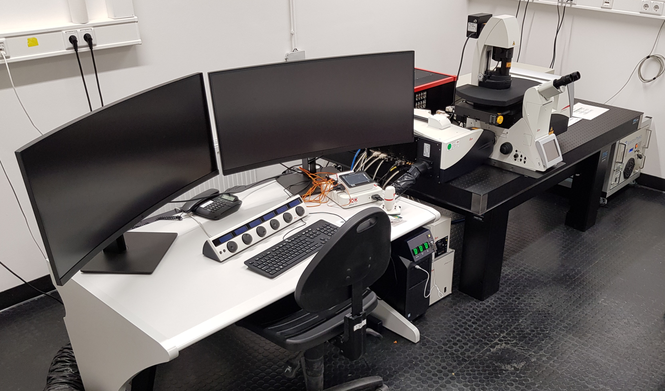 Extension of the Zeiss / Spectra-Physics intra-vital microscope with four new detectors for simultaneous image acquisition (4 NDDs consisting of 2 MA-PMT and 2 GaAsP detectors on the left side-port of the LSM 880 NLO system. "First trials of optical clearing of plant tissue without fixation for intra-vital imaging of virus infection in N. benthamiana leaves by multi-photon microscopy" is a challenging new technique pushed by scientists from OICE and the group of B. Krenz (Plant Biochemistry). This was of sufficient interest to the reviewers to give us (Ralf Palmisano) the opportunity to talk to the audience at MMC2017 in Manchester. Furthermore we (Philipp Tripal) also presented a poster on "Extending the insight into in-vitro human cornea by using multi-photon microscopy combining fluorescence with SHG imaging reaching out for more than 2 mm of penetration depth" in co-operation with the Fuchsluger group from the Opthalmic medical department. 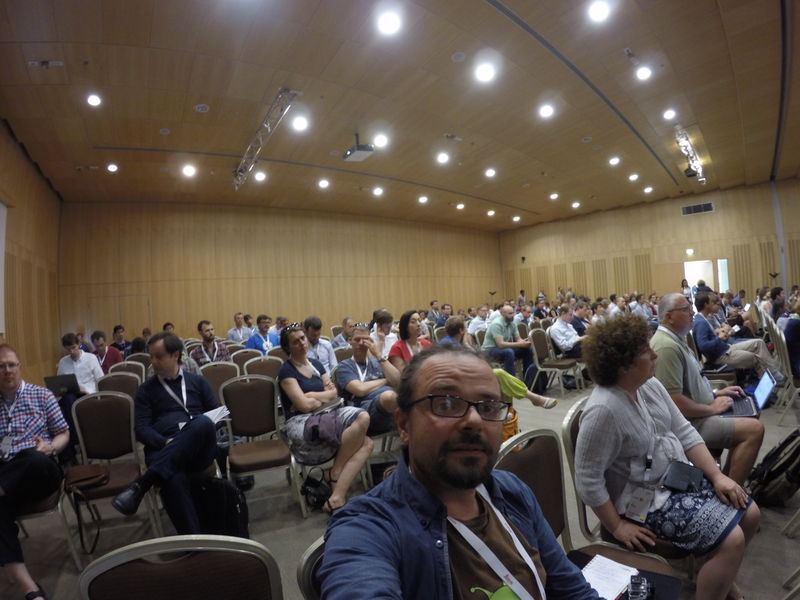 OICE was picked to give a plenary lecture at ELMI (European Light Microscopy Initiative). Member of staff Philipp Tripal stood strong and stable and of course he shone! 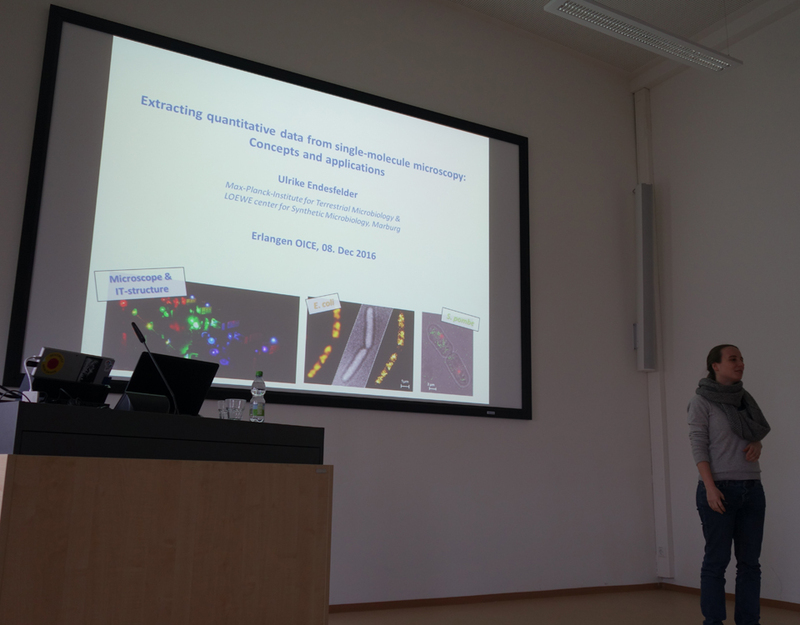 Philipp talked about "Three dimensional live cell imaging of intestinal organoid structures by spinning disc microscopy". This is a very challenging emerging new technique and a great co-operation with Prof. Becker and members of his Division of Molecular Gastroenterology, Department of Medicine 1. Together we are creating fascinating new protocols to establish long-term observation of multicellular organoids of different origin. This will reveal new insights. Full abstract can be found here. On Thursday 11th the roofing ceremony of the IZNF Research Building took place. 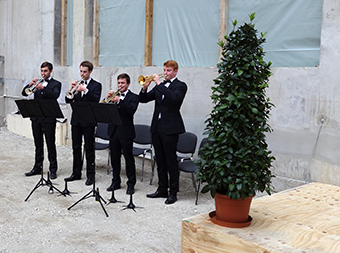 A great opening by trumpets was followed by welcoming speeches from Dieter Maußner, Head of the State Building Authority, the Bavarian Home Secretary Joachim Herrmann, the Parliamentary Secretary from the BMBF Berlin Stefan Müller, followed by Erlangens Town Mayor Dr. Florian Janik, the FAU President Prof. Joachim Hornegger and the Chair of the Excellence Cluster Engineering of Advanced Materials (EAM) Prof. Peter Wasserscheid. The ceremony was concluded as it is the long lasting tradition by the site manager Holger Kessler and his ganger. When the toasts were given and the well-wishing, including the breakage of the glasses (thrown down from the second floor...) had happened we all enjoyed the traditional feast together with the builders, craftsmen and workers form the construction site. They did a tremendous job so far, as the building process is fully within schedule by now. More images can be seen here. On March 29th we had the pleasure to get the first tour through the almost fully erected new research building. It is very impressive to see this place now grow fast and we were told, that the builders are only a few days behind schedule due to some frosty days, while it was planned to process some concrete. 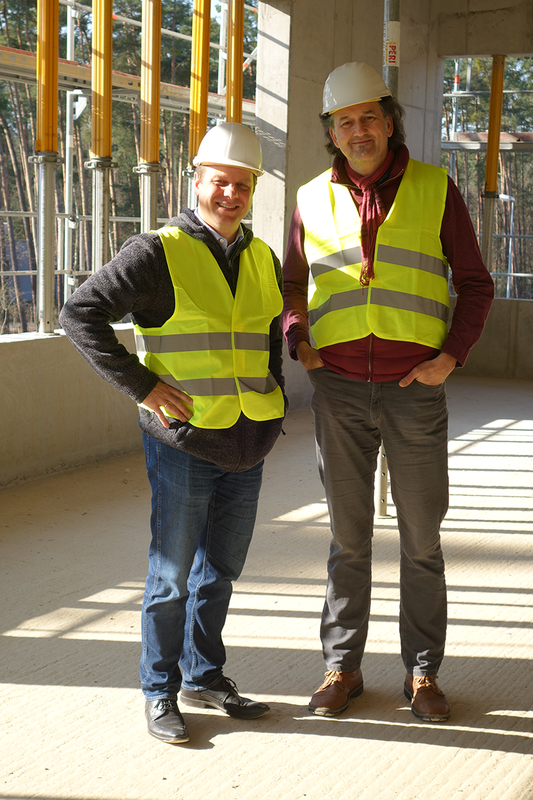 Prof. Erdmann, Spieker from CENEM, and Dr. Ralf Palmisano (OICE) standing on the first floor of what is to become Prof. Spiekers office, with the site to become Dr. Palmisano's office in the background. Obviously both are looking forward to start co-operations between the electron and the light microscopy unit. This was it. The 1st open day @ OICE. More than 60 participants made their way to the keynote lecture given by Dr. Ulrike Endesfelder, from the MPI Terrestrial Microbiology talking about Single Molecule Localisation Microscopy. Dr. Endesfelder gave us the pleasure to share latest yet unpublished fascinating data from her group. That was appreciated very well from the audience. This was followed by 5 inspiring short talks. The demo sessions were also very well looked after, before people gathered for some nice food and drinks to talk. We are happy to announce that the one of its kind set-up for intravital imaging has arrived and OICE will deliver courses for our users quite soon. It is a custom build setup with Carl Zeiss and Spectra-Physics. The basis is a Zeiss 880 Axioimager fixed stage NLO system, with an Airyscan detector and non-descanned detector directly built into the turret at the backplane opening of the objective lens. This you will not loose a single photon emerging from your intravital samples while using MP excitation. The DeepSee laser delivers a tunable range from 680 up to 1300 nm and a fixed wavelength at 1040 nm. This will certainly enable FAU and adjacent user to perform uncrompomised deep tissue and intravital imaging. 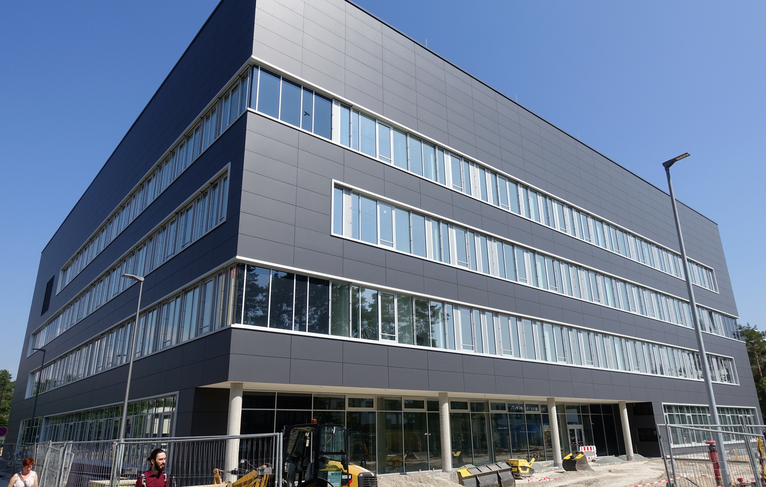 On May 6th ground-breaking ceremony took place for the new research building of the Interdisciplinary Centre for Nanostructured Surfaces. Representatives from the Friedrich-Alexander-University, the City of Erlangen, the State of Bavaria and the Ministry of Science and Education from the German Goverment made their way to celebrate. With a bright blue sky and a warm summer like breeze the representatives and honorary guests were all smiles. The combined effort of 40 million Euro we lead to a unique assembly of different approache on nano structures and their developement. OICE will be the major permanent user of this new building covering approximately one quarter of the floor space. More information in german are accessible here. We are absolutly delighted and are looking forward to the second half of 2018 when we hopefully will be moving into our then new home. 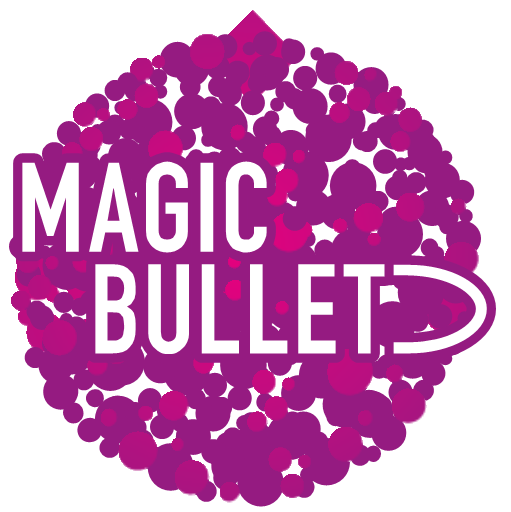 As OICE is part of the ETN MAGICBULLET, consortium within the Horizon 2020 MSCA excellence initiative, we are happy to have had the first imaging workshop for the ESRs from four different european countries within the EU. The workshop took place March 7th - 11th. Some obviously happy ESRs from the consortium enjoyed a packed week of imaging and sunshine! We are happy to announce that OICE can offer to make use of a phantastic cell line for your Resolft super-resolution imaging that is stable transformed with Vimentin-rsEGFP2. This is agenerous gift by Prof. Stefan Jakobs from the Max Planck Institute for Biophysical Chemistry in Goettingen. If you are interested in using it at OICE, please contact a member of staff.